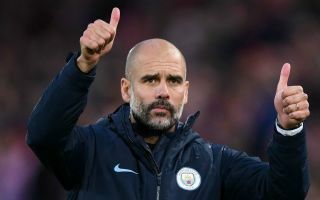 Despite having enough firepower to launch a bid for a quadruple this season, Pep Guardiola is reportedly eyeing a transfer target to bolster his Man City attack this summer. Having already secured the League Cup, the Premier League title, Champions League and FA Cup are still in play for the Manchester giants in the coming weeks. Ending the campaign in strong fashion will now be crucial as they won’t want to allow this opportunity to create history to slip away, but it appears as though Guardiola is already looking at ways to improve his Man City squad for next season. As reported by Calciomercato, via Telefoot, City are keen on signing Nicolas Pepe from Lille this summer, but they will face stiff competition from Inter, Juventus and Bayern Munich. The report comes as the 23-year-old is having an excellent season in France, scoring 19 goals and providing 12 assists in 34 appearances for the Ligue 1 outfit. That would suggest he could be a sensible signing for Man City, but given the options already at Guardiola’s disposal, it has to be questioned as to whether or not the Spanish tactician really needs another attacker. Sergio Aguero, Gabriel Jesus, Bernardo Silva, David Silva, Leroy Sane, Raheem Sterling and Riyad Mahrez are all already battling for places in the starting line-up, and specifically adding another winger would seem unnecessary for Man City. If anything, with Aguero struggling with his fitness in recent weeks, perhaps adding another out-and-out striker would make sense to offer quality depth, but with Pepe a natural right-sided winger, Guardiola would arguably be better off prioritising other areas of his squad. Nevertheless, the more immediate focus for the reigning Premier League champions will be getting the best out of their current players to ensure that this turns out to be a historic and memorable campaign.